Broad smiles or an anxious rictus? On 15th April, Nokia announced its intention to acquire Alcatel-Lucent in an all-share deal. 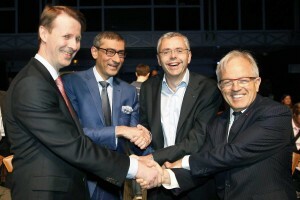 Nokia’s Risto Siilasmaa and CEO Rajeev Suri were seen exchanging a warm hand shake with Alcatel-Lucent’s Philippe Camus and CEO Michel Combes, all four gentlemen displaying beaming smiles as the news of their forthcoming merger hit the news wires and sent shock-waves across what is already an extremely consolidated industry. That news was not completely unexpected: Nokia, and more particularly Alcatel-Lucent, have gone through some very painful and convoluted restructuring exercises these past few years, and are only now feeling the first early signs of some recovery. Still, each has areas of weakness which the combination of both groups could potentially resolve. Furthermore, wireless communication is an area that requires astronomical R&D budgets. As consumers begin to embrace 4G communication, the world’s leading providers are already putting the finishing touches to the future 5G, announced for the early 2020’s, and teaming up to finance those developments and rolling them out across the globe makes eminent sense. The business case for this merger is plain to see on paper, but whether the expected benefits will materialise during the implementation remains to be seen: several formidable challenges lie ahead. None of them impossible, but each one of them pretty tough! Whereas Alcatel-Lucent has for years enjoyed strong market presence and excellent relationships with major telecommunications operators, Nokia has struggled to get anywhere in that area, allowing another Nordic company, Ericsson, to share that large and lucrative market with Alcatel-Lucent. It is fair to say that Alcatel-Lucent’s saving grace in the USA is the fact that the world’s largest provider of wireless systems happens to be China’s Huawei, which is de facto barred from penetrating the United States’ market amid fears of industrial and political spying from a company that has close ties with the Chinese government. By tying up with Alcatel-Lucent, Nokia will clearly be able to shoehorn itself into the lucrative American market, but whereas there were three non-Chinese suppliers of telecom equipment on that market, Nokia, Alcatel-Lucent and Ericsson, the merger will bring this down to two. Who will the third provider be that is required for any fair tendering process? As Huawei is likely to continue being denied access, the Nokia-ALU merger might create unforeseen potential for Samsung, thus far confined to the Asian market, to leap onto the American stage. Once bitten, twice shy? Not for Alcatel-Lucent! Any M&A integration brings its own share of difficulties and struggles, but Alcatel-Lucent have suffered more than most; by comparison to the vision which was depicted back in 2006, the Alcatel-Lucent merger will be remembered in history as a failure. Being viewed as a strategic asset by French Governments will have been both a blessing (too big and strategically important to be allowed to fail) and a curse (government intervention which would rather apply a dressing onto the wounds to hide them rather than approve a remedy that would cure the causes). Almost ten years later, the cultural split between the former French iconic company and its American “spouse” is still prevalent. Bringing in some “new blood” and an external perspective under the Nokia umbrella may provide a fantastic opportunity to lay a new base for the company’s culture and ways of working, away from the polarised Franco-American divide; this would enable the combined group’s global ambition and cement the alliance to become a true powerhouse with unrivalled R&D capability. Alternatively, the French government may continue to block any attempts to shape the Nokia-Alcatel-Lucent alliance as a world leader, by resisting any changes that might have the slightest detrimental impact on French jobs, pursuing the more self-centred goals of their re-election agenda. The weight of bureaucracy combined with restrictive labour-law practices might slow down the transformation of the business, and the new group could altogether miss the opportunity it is striving to capture in such a rapidly evolving market. For over a decade, the internet and mobile communication sectors have been subjected to a pressure that is uncommon in other services: end users, be they consumers or corporations, expect the performance of their telecommunications and internet services to double in performance every 2-3 years, but without accepting to pay a single cent for that improvement. Indeed, billions of consumers seem to consider access to the internet to be a natural right, in the same way as we can enjoy sunlight and air to breathe. “Free” internet is a reality for numerous users, and we see huge resistance against attempts to introduce differentiated tariffs for heavy users compared to average users in the light of data streaming sites that require a very broad and steady flow of data to the end-users. The frantic race to provide ever faster data transmission speeds without any price increases to users has evidently put tremendous pressure on the providers of the equipment required to provide those exponential service improvements. This, coupled with the fact that revenues from data transmission did not follow the projections the telecom providers had forecasted a decade ago, means that the key source for potential margin improvement is to reduce the cost of the underlying infrastructure. This is guaranteed to make life difficult for many years to come for the few telecom infrastructure providers left in this world, but combining that sharp commercial and cost cutting focus with the demands of a global M&A integration and transformation of business culture will indeed be a mammoth task. Not impossible, but quite daunting nonetheless. We must just hope that the authorities in Finland, and more particularly in France, do not prove to be the final straw on the camel’s back. If Nokia-Alcatel-Lucent fail, we won’t be left with much of a choice on this planet.